D H E A C O N A N.
THIS revision of the Gaelic translation of the Book of Common Prayer has been carried out by a Committee appointed by the Episcopal Synod, and is sanctioned by the Bishops, who, however, leave the responsibility for the accuracy of the translation to the Committee. L E A B H A I R S O. 2. Mu Sheirbhis na h-Eaglais. 4. An t-Ordugh anns am bheil an Saltair air a shuidheachadh gu 'bhi air a leughadh. 5. An t-Ordugh anns am bheil a' chuid eile de 'n Sgriobtuir naomh air a shuidheachadh gu 'bhi air a leughadh. 6. Clàr nan Leasan agus nan Salm shònraichte. 7. Clàir agus riaghailtean air son nan Làithean-féille agus nan Làithean-trasgaidh rè na bliadhna uile. 8. Am Mìosachan maille ri Clàr nan Leasan. 9. An t-Ordugh air son Urnuigh Mhaidne. 10. An t-Ordugh air son Urnuigh Fheasgair. 13. Urnuighean agus Breith-buidheachais air son caochladh aobhairean. 14. Na Guidhean, na Litrichean agus na Soisgeil ri 'n gnàthachadh aig Frithealadh a' Chomanachaidh naoimh rè na bliadhiia. 15. Ordugh frithealadh a' Chomanachaidh naoimh. 16. Ordugh Baistidh fhollaisich agus uaignich. 17. Ordugh Baisteadh rnuinntir a thàinig gu aois. 18. Leabhar nan ceisdean, maille ri Ordugh Comh-dhaingneachadh leanaban. 20. Coimhead na Muinntir thinne, agus Comanachadh na Muinntir thinne. 22. Breith-buidheachais air son Bhan un déigh asaid. 23. Comh-bhagradh no Cur 'an céill corruich agus breitheanais Dlié an aghaidh pheacach. 25. Ordugh Urnuighean ri 'bhi air an gnàthachadh air muir. 26. An Riaghailt agus an Dòigh air Orduchadh Easbuigean Shagartan agus Dheaconan. 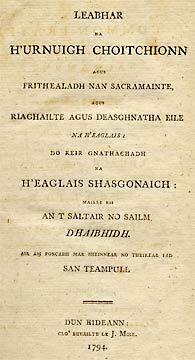 The (1662) Book of Common Prayer was first published in Scots Gaelic in 1794 (title page is below). A translation was not made until this late date partly to avoid controversy with the (Presbyterian) Church of Scotland, and partly because it was wrongly believed that the already-existing Irish Gaelic BCP would be acceptable (Scots and Irish Gaelic are similar, but certainly not identical). The translation used here, made in 1895 (which appears as 37:5 in David Griffiths' Bibliography of the Book of Common Prayer), was the last produced in Scots Gaelic; it appears that no translation of the 1929 Scottish BCP was ever made, although there are Scots Gaelic translations of the more recent 1970 and 1982 Communion services of the Scottish Episcopal Church. Both the 1794 edition (Griffiths 37:1) and an 1881 edition (Griffiths 37:4) are online as PDF graphics thanks to the Internet Archive. The 1794 printing is also available from Google Books. The details of the translation are gioven below in the Editors Note. Basically, it is a complete translation of the 1662 BCP of the Church of Enlgand; no separate BCP of the Scottish Episcopal Church existed until 1912. This book has additionally a Scots Gaelic translation of the Scottish Communion Service of 1764 bound up with it at the end. This service was widely used in the Scottish Episcopal Church, and formed the basis for the Communion services in the American and South African Churches. In addition to the main services in HTML (links at left), we also have the entire book as PDF images (wuith uncorrected text); see below. THE text taken, by the authority of the Scottish Bishops, for this revised translation of the Book of Common Prayer is that of the Sealed Books, which have been exactly followed, both in the matter translated, with the exceptions noted below, and in capital letters and punctuation as far as the Gaelic idiom allows. The exceptions, which have been made with the Bishops' approval, mainly consist (1) in the omission of the Acts of Uniformity, and the consequent re-numbering of the Table of Contents; (2) in the adoption of the Table of lessons and Order for reading Holy Scripture of 1871, according to Canon xxxv. of 1890; (3) in the adoption for the Epistles, Gospels, Psalms, and other extracts from Holy Scripture, of the Brevier octavo Gaelic Bible now commonly in use, together with many of the alterations found in the revised Minion octavo Bible of 1880; (4) in the omission of the obsolete columns and table in the Sealed Books for finding Easter ; (5) in the introduction in square brackets or in foot-notes, of certain phrases which were necessary for the proper translation of the book; (6) in the alteration of king to queen, with pronouns corresponding, and the insertion of the names of the present Sovereign and royal family; and (7) in the use of square brackets for the obsolete parts of the Ordinal. The work has been undertaken by a committee, appointed by the Scottish Bishops in November, 1890 ; since which date the revision has been continuously carried on.